Today I happened to be in Mexico City, and as America were playing at home on the Estadio Azteca I decided to go to watch the match. There is something special about being at the mighty and impressive stadium where Pele and Maradona both lifted the World Cup trophy. Where Maradona and Carlos Alberto scored two the greatest World Cup goals ever! So more than anything it was fantastic to be in this altar of the game. The match between America and Santos Laguna was important as it was the last match of the league stage of the Mexican Championship, and with both teams qualified, America nevertheless wanted a good result to end with a lower standing opponent. 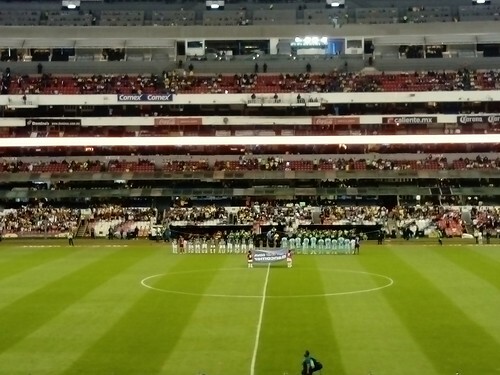 Santos were above America before the match, so a tie was ok for them, and you could see it by the fact that they largely decided to park the bus (altthough Djaniny did create some dangerous chances) in particular in the second half, when America tried to put more pressure on the visitors. But two substitutes made the difference: The young Paraguayan Cecilio Dominguez (who was nevertheless a surprising non-starter) came on and got a penalty that the ex-PSG and Milan player Jeremy Menez (who came in after four weeks out due to injury) scored on to give them the victory. America ends on second position (behind Toluca) and will be playing the seventh qualified team. The America fans were great, but watching the Mexican league I still would love to see the splendid Chivas and Rayados fans. I have still not fallen for a Mexican team, but may still with time! Never count Roma out: 5-0 down they managed to pull two goals back to lose 5-2 to Liverpool in the first leg of the Champions League semifinal. So all they need to do now is what they did against Barcelona: win 3-0 in the second leg. While predictions in football are something to avoid, I predict this will not happen. Liverpool defend better than Barcelona, and Roma coming back from behind a second time would be completely unprecedented in history. Liverpool are almost sure to be in the final in particular thanks to two players who were outstanding today: Mohamed Salah and Roberto Firmino each scored two goals and made two assists, and are looking hungry for more goals in Rome. Never count Roma out, but I count them out. My Grandfather took me to my first football match. It was not virtual, but on the actual ground, Nick Hornby Arena, for a local derby between Arsenel and Tottenham. It was their first Premier League clash following the Dark Centuries, when Arsenel had struggled in the lower leagues, while Tottenham had gone on to win their legendary 18 Champions League titles in a row, even winning the Penta in 2432 (Premier League, FA Cup, UEFA Champions League, FIFA World Cup and the Toto Cup). My Grandfather was a sucker for Arsenel, just like all our ancestors back for generations. In fact, when nations were eliminated my Grandfather had immediately taken Arsenal (as it was called back then) as his primary identification marker. "Some suckers take some old nation state, a religion or some city! But not me! I am an Arsenal man, because that is REAL! ", our ancestor appears to have said, although no definite proofs have been found in his Life-Social-Media-Footprint that otherwise registered most of his life to an embarrassing level of detail. I had not really wanted to go to the Nick Hornby Arena. As most kids in our generation, more accustomed to the virtual world, I was more comfortable with the crowds of Avatars in the Immersive Internet, where nothing physical could hurt you. "Nonsense kiddo", my Grandfather had said. "You will love it! It has happened to everyone in our family! And who knows? You may be the first to see Arsenel defeat Tottenham for three-hundred years!" I did love it. And I have loved Arsenal ever since. That match in the Nick Hornby Arena became legendary, not just because it was the first victory of Arsenel over Tottenham for 311 years, but also because it was the return of the legendary Arsene Wenger to manage the team. "Ever since Arsene Wenger left Arsenel in 2018, everything just went downhill", my Grandfather was telling me as he usually did when he wanted to educate me about history. "The Sea Rising, the Alien Invasion or the Robot Rebellion were just mere details compared to what happened to Arsenel! After 22 years of being one of the best clubs in the world, it just went downhill. Back then fans never knew how good they had it with Mr. Wenger, but they soon knew all right! Only ten years later Arsenal were playing in the lower European Leagues, mainly against other shite clubs from Finland and Catalunya!" Indeed, things had gone from bad to worse. Arsenal's best result for 298 years was a quarterfinal against FC MidtogOstjyllandGymnastikOgIdraetsforening in the Danish Cup, where they only lost on penalties (and to pour salt on the wound, it was a John Jensen who scored the winner for the Danes). During the Dark Centuries, when Tottenham was winning everything and an evil Alien Force was ravaging the planet, and people were returning to religion, Arsenal fans had gotten together to erect shrines and pray to Saint Arsene: please come back and lead Arsenal back to glory! It was then that the club had been renamed Arsenel, and initially things had looked good when they made it back to the Championship, where they had stayed for some decades as the Robots, who had helped defeat the Aliens, rebelled when their team of Real Madrid Robots was destroyed in the Champions League final by none other than Tottenham (and to be frank, every Arsenal fan had supported the Robots, meaning that they had fared quite well during the Robot Rebellion). But it still took another 160 years before Arsenel were back in the Premier League. By then the club had been bought by a Jovian multi-billionaire who promised Arsenel fans all over the Galaxy that he would make Arsenel champions of something, but only managed to get them back in the Premier League after a legendary promotion match against Charlton Athletic played on the low gravity of the Moon (Charlton fans have been complaining ever since that the low gravity was the reason they kept shooting over the goal). Nobody knows where the idea first came to create a new Arsene Wenger. Some rumours said it was after two drunken Arsenel fans working at the robot facility on Mercury, visited Madam Tussaud's museum, where they had seen a pretty bad wax-android version of Jose Mourinho discussing Relativity Theory with David Bowie. They posted it on Instagram, and soon Twitter-Galaxy was swarming with the hashtag #createanewWenger. Arsenel fans all over the Galaxy poured all their economic and scientific efforts into the endeavour. Of course there had been many advances in cloning and bio-engineering, but to create a true exact copy of a historical figure had never been successful until these Arsenel fans took over. Some decades later Arsenel signed their new (old) manager Arsene Wenger, and he was to have his debut as manager in a clash against the defending champions of Tottenham. 311 years since Arsenel had last beaten Tottenham I was there when Arsene Wenger led them to a legendary 5-3 victory, and eventually the first title since the FA Cup in 2017 (also under Arsene Wenger). I was only a kid who fell in love with Arsenel. Since then I have seen Arsenel win 12 Premier League titles, 17 Champions Leagues, 3 FIFA World Cups, 15 FA Cups (where Mr. Wenger beat his own record from the 21st century), and an unprecedented 23 Toto Cups! Five Hundreds years after Wenger left Arsenal, we are again winning because Arsenel can only win anything with the great Arsene Wenger as manager! My Grandfather is not with us any longer, but today, FA Cup Final 2518, I am taking my own Grandson to Wembley Stadium in Paris to watch Arsene Wenger lead Arsenel to another victory against Tottenham! Last time my favourite team, Brøndby, won the Danish league title was in 2005. Back then, I was living in Ghana, but had returned on vacation and saw my favourite side take the title against Herfolge. Since then I have traveled the world, currently living in El Salvador, but Brøndby have not won a title since then, but have come through deep crises that almost saw the club disappear. The last few years Brøndby have been building a team to supersede the new "artificial" clubs of FC Copenhagen and FC Midtjylland (both are relatively recent clubs established in 1992 and 1999 respectively as mergers of more traditional sides. Since 2005 Copenhagen have won eight Danish championships and FC Midtjylland one). As a Brøndby fan I have been following it and hoping from afar, but not daring to really hope they could take the title despite them having had a consistent lead this season. While FC Copenhagen are no longer in the fight for the title, FC Midtjylland have been keeping up with Brøndby, so yesterday's match between the two sides was almost a final. But I was delighted to learn that after being down 2-0 in Herning Brøndby came back from behind and took a 2-3 away victory, and are now three-points clear at the top of the league. Hope has become expectation, and I am ready to celebrate alone here in El Salvador! Tickets for the World Cup in Russia? Let me start this post by clarifying that I am naive and an idiot: I don't understand that buying a ticket for a football match has to be so complicated! I am the kind of naive idiot football fan who has the time and means to go to a World Cup match. I think it will be a great World Cup, that Russia will be great hosts, and I would really want to go to watch some of my favourite teams! Unable to get a ticket I gave up. After a discussion with a good friend we decided to go for one of the few tickets left for a match nobody wants to watch in a faraway corner of Russia. So I will be going to the World Cup, even though I will attend a match that I am not really interested in, in a place that can only surprise me positively because outside Moscow and St. Petersburg, I have no knowledge or expectations about Russia. (I would be happy about any first-hand recommendations about Rostov-on-Don). These are not sites I found on the dark net: you can simply google them! FIFA knows well that they exist, but this does apparently not prevent the sites from openly (and transparently) selling the tickets. Prices are generally higher than on FIFA, but they are not unattainable. The tickets seem legit, which means firstly, that they have had some way of hoarding these tickets through the FIFA site (which already requires some skills that an idiot like me doesn't have, since I was not even able to get a single ticket) and secondly that these sites, guaranteeing money back, must be pretty sure that FIFA's warning about not obtaining tickets outside their site is a largely hollow warning. 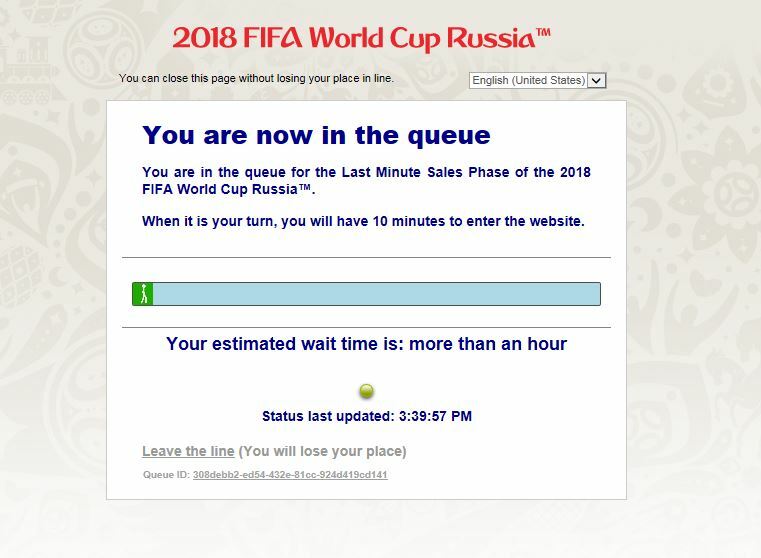 These sites must be estimating that only a fraction of purchasers will be denied entry, opening up for a pretty nice margin for doing something that FIFA does not allow (I think that part of the speculation is that FIFA probably fears empty seats more). And conveniently, the burden is on the person who buys the tickets; a football fan who tried in vain on the FIFA site, only to be intimidated for paying more for a ticket that otherwise seems to be widely available. All this said I am a naive and honest idiot: I am not so adventurous as to venture into one of these sites to get to the World Cup, even though I know plenty of fans will probably do it with no consequences. Honesty doesn't pay. 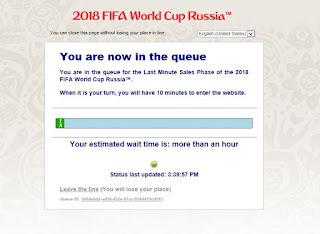 In the end, I find that all this leads to more questions about the ticketing for the World Cup: how do these sites get their tickets? How does FIFA allow it? How many people would get in through purchasing tickets on these sites? (I would love to hear if you are one!) Who is making the money...? Toronto was looking to be the first MLS team to win the CONCACAF Champions League when they hosted Chivas Guadalajara in the first leg of the final. Toronto was unbeaten at home and was looking for a good result in snowy Toronto before heading to Guadalajara. But it took only two minutes for Chivas to take the lead on a goal by Rodolfo Pizarro, and they were looking the better team until Jonathan Osorio equalized for the home team. Toronto were unlucky and some great saves by Miguel Jimenez kept the Canadians from taking the lead before halftime. In the second half Chivas seemed in good control, and took the lead through a great free kick strike by Alan Pulido, and in the end could have scored more goals against a Toronto side that seemed to have given up. With 90 more minutes left, Toronto should not give up. But there is no doubt that they will be against all odds to take the title in Guadalajara, so it is likely that the Concacaf Champions League will remain in Mexico, but this time with a Chivas side that has not won since 1962. With Roma's comeback and Juventus' close comeback (arguably halted by a referee decision) it was now the turn of the Europa League, where we got another amazing comeback when Red Bull Salzburg was behind 2-4 against Lazio. Ten minutes into the second half Lazio went ahead 0-1, and there you might have thought that Salzburg was done for. But no: after an equalizer, Salzburg scored three goals in three minutes to win 4-1 and make it to the semifinals of the Europa League. Less impressive comeback was that by Olympique Marseille, who, trailing Red Bull Leipzig 0-1, won 5-2 and also made it to the semifinals. CSKA Moscow was up 2-0 against Arsenal, with hopes of another amazing comeback, but Arsenal scored two and progresses to the semi-finals. Finally, Sporting Lisbon managed to defeat Atletico Madrid 1-0, but that was not enough after having lost the first match 0-2. Chivas Guadalajara held on heroically to a 0-0 against New York Red Bulls, and following their 1-0 home victory made it to the CONCACAF Champions League final. 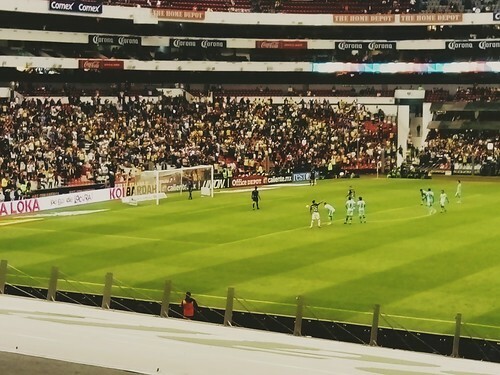 There, they will face Toronto FC, who tied Club America 1-1. Their victory was never in doubt following their 3-1 home win, and when they went ahead 0-1 at the Estadio Azteca. Chivas Guadalajara only won the highest honour in CONCACAF in 1962, and reached their last final in 2007. Given their poor season, this final will be very important for the Mexican side. Last time a non-Mexican side won the tournament was in 2005 (Saprissa), and the last time an MLS side won was in 2000 (LA Galaxy). A Canadian side has never won the tournament before, so this will likely be a historical final: Toronto FC are surely favourites, having been solid throughout the tournament, while Chivas have struggled through the tournament and the season. The final is to be played over two legs, and here Chivas has a slight advantage as they will play the second leg at home. I took time out for lunch to watch the Champions League semifinal in a restaurant in San Salvador. Manchester City-Liverpool was the match of choice. In San Salvador, few people watch English football, and most people prefer Barcelona or Real Madrid. So as everyone took for granted that Barcelona was through, there was nobody else watching football in the restaurant. As expected Manchester City-Liverpool was a great match: City played a great first half, which they were unlucky not to be leading by more than a goal by halftime. But the second half saw a different Liverpool side emerge, as first Mohammed Salah and then Roberto Firmino gave the Reds a well-deserved victory and a place in the semifinal. When Salah equalized for Liverpool it had become obvious that the match to watch was Roma-Barcelona, as the Italians were leading 2-0, and would sensationally go through with a third strike that all of a sudden did not look so impossible. Thus, many people in the Salvadorean restaurant turned their eyes towards the match, and were chocked to see Kostas Manolas score a third goal that in the end brought Roma through, and made them only the third team in the Champions League to overcome a three goal loss in the first match (the second one being Barcelona themselves when they defeated Paris St. Germain last season). One cannot help but be happy for Roma, who did what everyone considered impossible, namely to defeat FC Barcelona's arrogance. Roma have done this throughout this season: Atletico Madrid and Chelsea underestimated them, but came behind them in the group stages. I do not think that Roma will win the Champions League, but any team that underestimates them will suffer the consequences. I had a great lunch break, thank you. What Cristiano Ronaldo did today with his second goal against Juventus was football art: a perfect "Chilena" (bicycle kick for the Anglo-Saxons) that can be watched again and again. Sublime in its timing, where the ball and the body perfectly bond in a second to create a goal that appears to be impossible, but made possible by Ronaldo's genius. Cristiano Ronaldo is having a perfect Champions League season, carrying Real Madrid on his shoulders as other geniuses are carrying other teams. Ronaldo? Messi? Neymar? etc? The discussion about who is best is idiotic. These are artists; geniuses at their trade. People may have their personal preferences, but nobody discusses whether Sheakspeare is better than Cervantes. Whether Van Gogh is better than Rembrandt. Whether Einstein is smarter than Newton. These are geniuses, and their genius can not be compared, it must only be praised and admired. This is the case with footballers such as Ronaldo, and I am thankful I get to watch him and many other footballers.